So let’s say you’re writing your everything-is-a-service web application and you’ve got RESTful and/or SOAPy calls to your middle tier and everything’s going swimmingly until you discover you need to integrate your app with some 80’s-era RAD Windows application that no-one has the sourcecode to and embodies some vital bit of business intelligence that you need. [*]: (For those on Windows Metro, notepad is this application that allows you to write words into a white square on your computer screen and gives you the ability to recall those words later on if you give it what we in the tech industry call a “file name”. This is a bit like a URL, except it doesn’t run on raindrops and icecream). Wouldn’t it be nice if your software could automatically interact with that application, wrap it up in a service-oriented bow and then deliver it’s results to you in a method that some would consider slightly more standardised ? 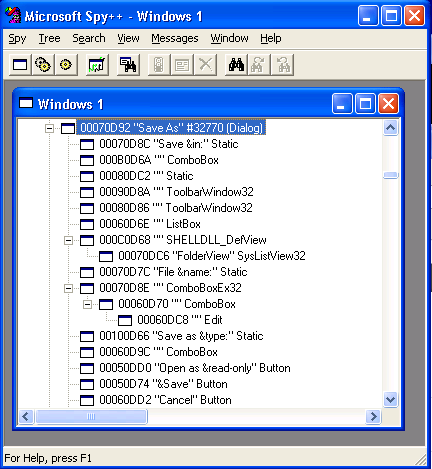 The dialog box is made up of windows and controls, which are visible in the Windows™ window hierarchy. If you fire up the venerable Spy++ from MSDN, you’ll notice that all the objects on your desktop, including the dialog box, are arranged in a treelike structure. The Document Object Model (DOM) is also a treelike structure, and has a whole arsenal of utilities that operate on it (XSLT, XPath, that sort of thing). which grabs a handle to the Save button on a Save As dialog for a notepad window, and sends a WM_CLICK message to the control’s message loop. Which is useful if you want to automatically press the Save button on a Save As dialog on a notepad window without paying half a million dollars for HP LoadRunner. * @param doc The XML document populated by this callback. *   which will contain new child elements. * parent nodes were not generated. * @return the hwnd of the element. Hooray. Next week I’ll use this thing to extract some values from a list box. Hi Rahoolm. I’ll put both of those up in a later post; in the meantime you should be able to just comment out any lines that use those classes and it should still work. Hi, how do you generate the xml according to microsoft tree?